NE 65th is vital for businesses, schools, and people who live, work, and play in NE Seattle. Sign a petition to support this campaign. 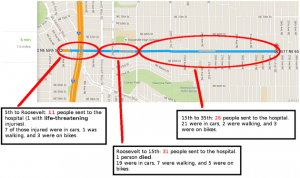 But in just the past three years in this short stretch NE 65th, 12 people walking or biking have been killed or sent to the hospital along just 0.3 miles of NE 65th St. In that same period of time, 12 car-only collisions injured 19 people. We can’t wait for more injuries or fatalities.